Looks great and I can still see out the back window. The fit and finish are excellent and the price is is right ! The nice thing is it doesn't take up your cargo space or interfere with rear view. I bought this thinking it would be a great way to mount my spare. I didn't notice that you have to loosen the cage down bars for installation. Since I had made my own cage, this presented a problem. After some head scratching, I came up with a way to mount it without changing the mount. I think this is going to be a great product for me, but I just had to do some custom work to install it. So, you can use this product on a custom or aftermarket cage with a little work. Would recommend to anyone looking for a nice spare tire mount that doesn't get in the way. I love this option to mount the spare up high. We use the bed of the RZR all the time for hauling stuff as well as hooking things to the receiver. We didn't want the spare tire off of the back and in the way. The view out of the rear view mirror is just fine. Only thing different is you see the center support bar which isn't that big of a deal. Just another great Tusk product! Installation relatively easy and straight forward. Disappointed to find no nuts to secure tire in kit. So even though installed in the field couldn't care tire. Have to make a trip to town and buy lug nuts to further test and evaluate carrier. 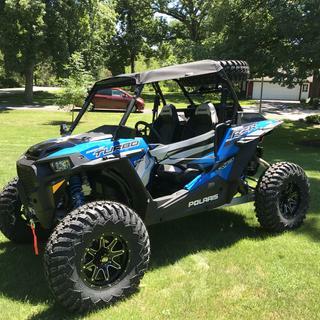 -m-2017 POLARIS RANGER RZR S 900--It was a simple bolt on. Had to lift the roof to slide it on but very simple install. Can't wait to hit the trails with it. Installed myself, easy job.. 10-15 minutes. Solid design. Fit perfect on 2019 XP4 Turbo. On the trail no shakes or rattles. Very satisfied with this purchase. 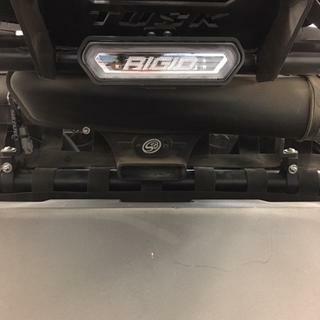 2019 XP4 Turbo with Tusk Spare Tire Rack. Fits great. Slight mod to stock plastic Polaris roof but not an issue. Quick and easy install. Very solid mounting, tire doesn't move or rattle. Rear view mirror is sorta useful. Works great on my 2017 RZR XP 1000 with 32" Tusk Terrabites. Excellent quality and easy installation.Would definitely recommend to get spare up and out of way. Good fit and appears to be of good quality. Seems like a good buy. The fit was very good for the spare tire but the roof kind of got in the way had to flip the spare over to get the 2 front lug nuts on. This spare tire carrier fit perfectly on my 2018 Polaris RZR XP 1000 trails and rocks edition. I mounted a stock tire and wheel to it. It was easy to install the tire mount, just follow the illustrated directions. I still have decent rear view visibility with the tire mounted. It does not come with lug nuts that are needed to secure the tire in place, but you can get a set of 4 online for around $8. Great product and great value. A friend had one of these and I helped him change a flat. Then I wanted one. Perfect placement to avoid being in the way. If you go off road and back in the mountains of CO as far as we go you don't do it without a spare, jack, etc. This carrier allows you to carry a spare, yet have your entire bed available for storage. It doesn't rattle and appears very well made. I am on my second UTV and have purchased several TUSK products. I have not been disappointed yet. TUSK seems to give you a lot of band for your buck and always well made for the long haul. Great mount, is very sturdy and does not move or vibrate at all. 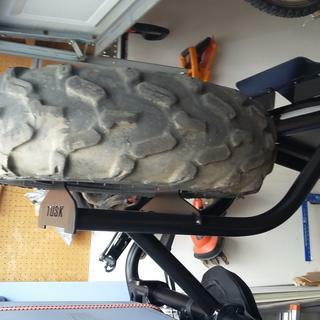 Fits perfectly on rear bars and is very firm. Love how it keeps tire up and out of way, but just below roof so no catching on things. Makes rear bed completely usable. It was easy to install. You still have good vision for reverse. It doesn't take up or interfere with the trunk space. Seems to be well built. Works great. It is very well built. It’s only downfall is it does not come lug nuts. We love the position of the carrier as we are still able to see with our rear view mirror & still utilize the cargo space! I have not tested for durability, but overal gets a 5 in my opinion. Easy install, looks good, still have good vision out back window, and I can still open cooler/storage. Nice product. Recommend 2 people for installation. 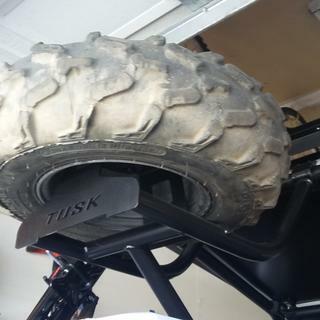 Very impressed how well the Tusk spare tire carrier is built. Looks great on my Razor and was simple to install. Love it! Great product with quality fit and finish. Works well with my over-sized 30" tires, and integrates perfectly when I installed my S&B particle separator. Still have full access to my Polaris RZR bed mounted cooler. Would purchase again in a minute. Fits perfect and it’s adjustable to the height you need! I’m really happy with this purchase. It is super solid and works just as it’s supposed to. Installation was a bit of a challenge for me...would’ve have likely gone better if I had a second set of hands. It took me three tries to get the height correctly so I could both see out of my rear view mirror AND fit the spare under/next to the roof. It also took me a bit to figure out how much to loosen the cage bolts in order to get this into the cage. I would buy again, however. It's made heavy duty works great! The clamps are maybe a little over kill , they are thick, but should last for a long time. You can still see behind you with use of a mirror also. can only mount with 2 lugs and leaves the tire at an angle. works but not optimal. Solid, no rattles and actually adds support to roll cage. Allows rear view unobstructed. Overall I like this carrier as it gets the tire out of the box. What I don't like about it is it blocks the upper half of your rearview mirror. You can see directly behind you (like 30-40'') but not further. For instance if your in a group you can't see if anyone is still behind you or if they had broke down five miles ago. Otherwise is very sturdy and well built. Almost wish it was on the lighter side as if I got into a rollover I feel it might compromise some of the integrity of the cage. Easy to install and you can set the height that you want. Don’t forget to order lug nuts to secure your spare. This is a very well made item and probably took 15 min to put on.It doesn't block the view out the back of the machine. Contrary to the manufacturer's listing that omits compatibility with the 2015 RZR S 900, I am confirming that this WILL FIT. I want to help others in their decision because the fitment guide is misleading. They answer NO over the phone because they're only relying on the fitment guide that was never updated. 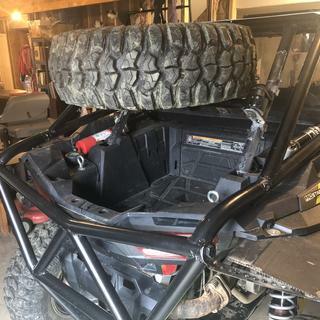 Will fit 2015 RZR S 900. Trust me! Very easy to install looks good and very functional. It works great, fit great and very easy to install. The only problem I have with it is, why wouldn’t they send a couple lug nuts with it to tie down the spare tire? Now I have to go the hardware store and try to find to right darn size to fit it. 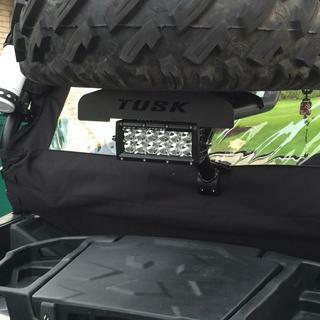 The Tusk spare tire carrier makes it so much easier to carry a spare on the trails. Took it to Wildcat this weekend and not only did it hold up great but I got a lot of compliments on it and people asking where I got it. Very easy to install. Installed in less then 30 minutes by myself with multiple adjustments. I like the fact that I can still get to my cooler without any adjustments. I would definitely recommend this spare tire carrier. 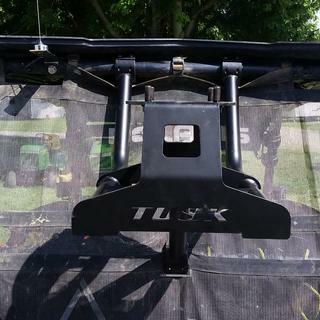 I liked every thing about the Tusk Spare Tire Carrier. It was very easy to install by myself and had absolutely no problems with instruction. I would recommend this product to everyone. Perfect placement to still use the bed of the RZR. how big a tire will it hold? BEST ANSWER: This will hold up to a 30" tire. What is the distance between the two mounting arms that go to the existing roll cage under the roof? BEST ANSWER: This will vary on each machine we sell this for. if you let us know what machine you have we can measure one for you. Can you still use a rear view mirror with this carrier? BEST ANSWER: Yes, you can use a rear view mirror with this carrier. Depending on the machine you might not be able to see much with the spare tire mounted there. It will most likely obstruct your view from seeing things behind you. You can use the side mirrors though if you would like. That would be another option. 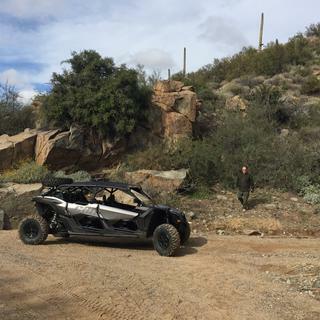 will this carrier fit a 2016 can am maverick? BEST ANSWER: This setup weighs 20 pounds. 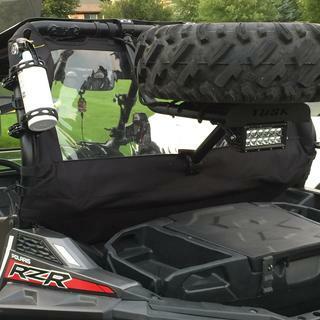 Does this spare carrier block the rear view mirror at all on a RZR 1000S/900S? 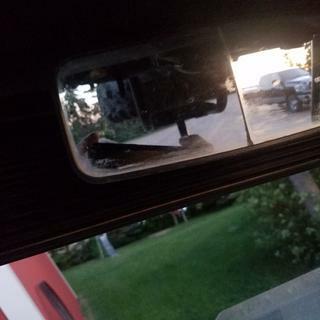 I mounted this on my 2017 RZR XP 4 1000 EPS and placed it high enough so that I can still utilize the rear-view mirror. I have the sport roof and it did not interfere with the tire. The mounting system for the Tusk carrier attaches to the two rear bars of the cage, as shown in the picture. 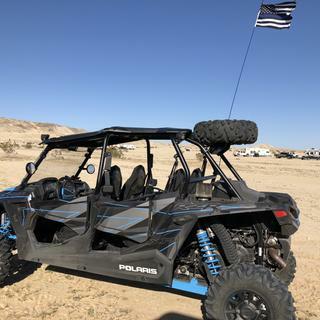 If your RZR 1000S has these bars and they are evenly spaced throughout the entire length, you can choose how high or low you want the carrier mounted. Of course it blocks some view simply becuz it’s there. But I’m presently negotiating my addition of a particle separator n the tire rack in a shared area. I need to lower the separator to accommodate the tire. This may further restrict my rear view. Sorry so long a reply. Couple of things going on at once. Tusk makes a great spare tire carrier for my 2018 RZR Turbo 4. It does not block my view from my rear view mirror, and I am running 30" tires on a 10" rim. 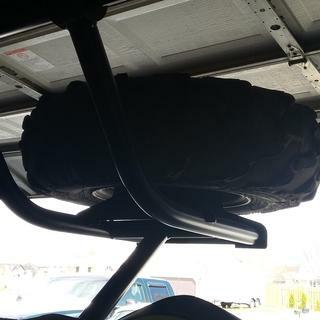 Best spare tire carrier I have found on the market for my RZR. I like the safety net you have on the back roll bar in your pictures. Where did you get it? Kimpex sport rear net. 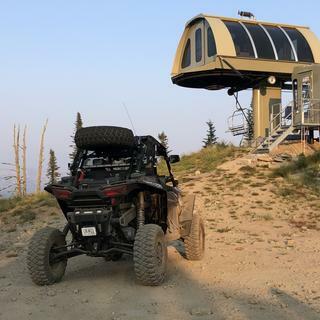 It is in Rocky Mountain ATV’s website. The fit is great, easy to install, and at a reasonable price. It depends on how high you mount it. We put ours high enough that you can see out the back very well. In my opinion it is a great product and if needed I would purchase another one. Hope this helps. 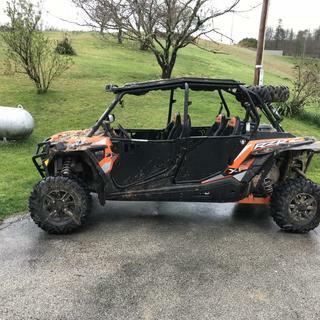 I have a 900 RZR. It does not block the mirror mounted on the underside of the cage top bar. However, I also use side mirrors. i notice there isnt one for a 16 rzr 900 4 will this fit the stock cage? BEST ANSWER: I measured my stock cage and it appears that would have to mount up by roof line and w/ a tire mounted to it it would stick above the roof about 10 to 12". I also measured apx. 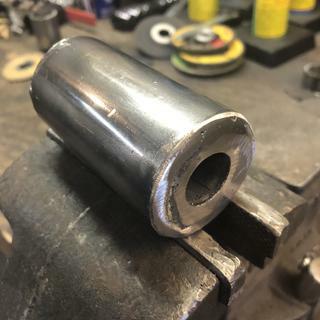 a 1/4" difference in width (carrier is wider) so you would possibly need to cut and weld carrier shorter to be able to install. Long story short it does not appear to be a direct bolt on application. No it will not fit the 16 rzr 900 4. The rear of the roll cage is different unfortunately. do the vertical frame pieces that the spare tire mount attaches to provided with the mount, or do I need to buy separatly and what are the separate parts that work for this? BEST ANSWER: the machines that this fits will have those bars. if your machine is listed and does not have those bars then it will mount differently, and will mount a little different. but it will be made for what your machine is stock. thank you for your question. Will this tire carrier fit a 32x10-14 tire? 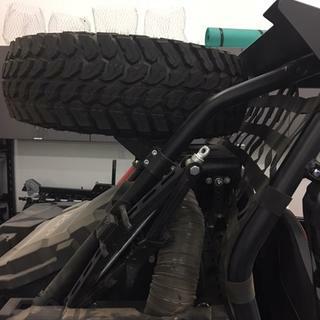 I would like to know what is the total length of this carrier from 1/2 of each mounting clamp which is welded to the carrier and do the mounting clamps fit a 1 3/4 inch roll cage this can be for 2014 2015 Polaris RZR 900 or 1000 ? 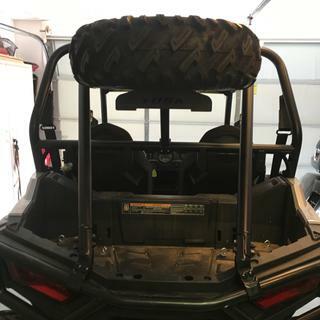 Will this tire carrier fit with the Polaris rzr plastic roof ? BEST ANSWER: The Tusk spare tire holder does not interfere with composite roof, or metal roof. 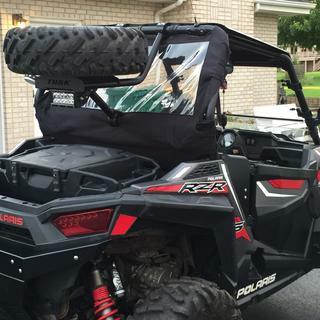 I have an aluminum roof on my Polaris XP 1000. It fit just fine. I love this design. I have a Polaris storage box in the back cargo area and I can still use it. Installation is very easy. Highly recommended. I have the aluminum roof on mine and it works great. I am sure it will work with yours as you can adjust it up and down the roll bar and set it where you want. It should. I have the Polaris aluminum roof. It clears it with no problems. Only tire I could find that still allows a visual of the background behind uou. I have an aluminum roof and I had to cut 2 indentations. The plastic roofs I have seen should go over the carrier mounts just fine. It will. I have one on a 2015 XP4 and a 2017 xp1000 with the Polaris roof. Yes, fits great just bolts on. 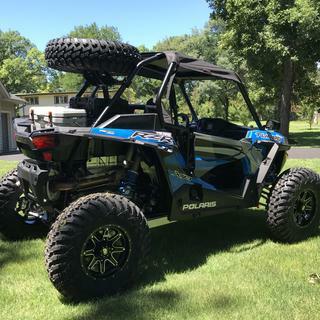 I have an XP4 1000 with the Polaris roof. Yes, I had to detach the back of the roof and reattach and it fit fine. Yes, that is what is on my machine. With a 29" spare. No problem. Yes, it does. I have this carrier and the Polaris plastic roof. Yes it will. I use a Polaris lock and ride roof. I noticed you commented that you mounted the Tusk spare tire mount on your machine with a Polaris lock and ride roof. 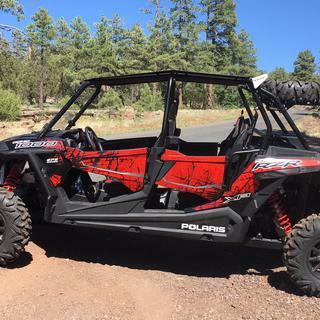 I have a 2017 Polaris Rzr 900S that has a Polaris Lock & Ride Poly Sport Roof (Polaris #2883073) installed on it. I am curious how much trimming or modification had to be made to the lock and ride roof in order for the Tusk spare tire mount to fit. Thanks. It fits on my 1000 so with 29" tires. It fits my xp4 with 29" tires. Can you still see out of rear view mirrow? BEST ANSWER: Depends on where you locate the mount. I moved mine up to see under it a bit, but which ever direction you go your going to obstruct the view in some way. It didn’t bother me too much as I used my side mirrors as well and felt I have enough view. YES, I can see very good. I moved the mount up so the top of the tire was level with the top of the roof. This lets me see good out the back and room to open the box and cooler lids up. Love it up and out of the way. Hi. the tire obstructs the view at the top of what appears in the mirror, but you can see well enough to see anyone following you. 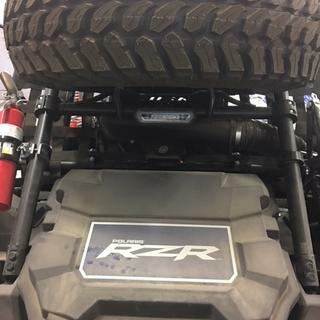 I can on my 2017 rzr 1000 EP XP 64 inch. I put tire carrier as high as I could and still have the tire evan with the top. If you're 6 feet tall, probably not. If you're shorter, than yes. But visibility is impaired a bit. Can see far behind. Yes it works great on my 2015 Polaris 900s. Yes, unless you are really tall. yes if you mount is high enough. Will this work with the poly Tusk rear window installed? BEST ANSWER: I believe so, I don't have that exact window but tire sits mostly behind the 2 support bars and window mounts to the vertical bars in front. Some aftermarket roofs can make mounting more difficult and does hinder rear view mirror. I have a rear window installed it is not the exact one you have referred too but I have no issues. I also run 32X15X9.5” tires. I dont see why not. Its a great thing to have and just bolts on the the rear part of the cage. Visibility is fine. Yes. Will not interfere with the poly rear window. 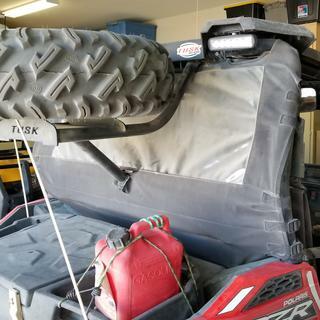 I have a metal roof on my 2016 rzr 900 trail, the tusk spare tire carrier that will fit my rzr is Part #1763940004. 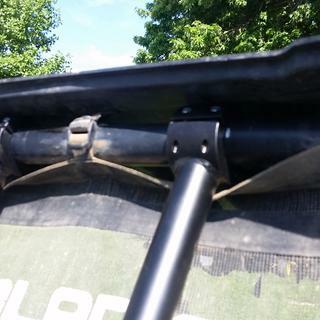 This attaches on the roof roll bar at 2 places, will my metal roof fit over those 2 places it attaches to ? BEST ANSWER: Yes I believe so.. 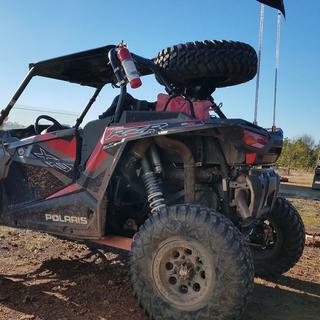 I have the RZR plastic roof and as long as the metal roof does not cone to far down the back roll cage you should be fine. You can actually adjust up and down we're the tire breach mouts. I have mine even with the roof line so I can access the cooler and tools easily under Neath in the bed. The spare tire mount in the photo does not mount anywhere under the roof. It attaches to two places (one on each side) on the rear roll cage angle braces. I did not have to disturb my roof at all to mount it. There is some vertical adjustment to the mount. I chose to mount the rack so that the spare tire top edge is just below the roof line. 2017 RZR 1000.I expect the 900 mount would be similar. Yes, it will but you will have to trim the foam insulation strip off the under side of roof. I also added and extra strip of foam insulation to help it seal better. No, I also have a metal roof on my 2016 900 trail and had to shim it up with spacers to make the Tusk spare tire carrier fit. I have had the spare tire rack for about a year and love it. It let you see out the back. It does not interfere with my roof. I have 30x10x14 crawlers and beadlocks and they fit. My rear shock cylinders are in the wheel wells not on the roll cage. I don't know if this would make a difference but I don't think so. Yes. I currently run a motohammer 32x10x14 and could go bigger. I’m also running an aftermarket cage so i had to chop the ends and realign to fit. it will for a front tire. most people run the same all the way around and it works great! yes, I have it on my 2017 xp ep 1000 64 inch and it comes stock with 30x10x14. 30x10x14- I would think so, my 30x10x14 Terrabites fit with no issues. I have a ProArmor XG 30”x10” 14” tire rim combo on mine. Yes. I have a 32” tire on mine and fits great. Will this work with a ryfab aluminum storage box? BEST ANSWER: I have the Reyfab box without the top rails. I have the spare carrier mounted on a 2017 1000 Rock 'N Trail. 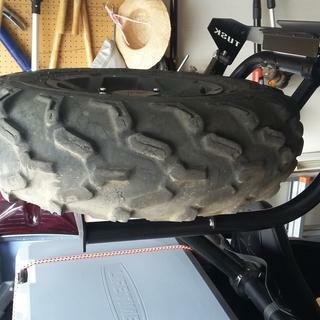 I'm using a 6" wide rim holding a 30 X 10-14 Pro-Armor Crawler tire. Rim is 4-2 offset. The lid opens fully with abot 1/8" clearance from the tire. Ed, how high did u mount ur rack? Is the tire flush w the top of the vehicle? Top of my tire is a bit below the roof. Where I mounted the rack was determined by where the previous owner had mounted the brackets to support extended intake tubes for the engine air and clutch cooling. Of course, where you end up ultimately mounting the rack will also depend on the size of tire and rim offset. I wish I could add a picture but that doesn't seem to be an option. I have a 2017 rzr 900 S and installed the Ryfab sloped lid box. The box lid opens to about 70 degrees before it hits the Tusk spare tire carrier. The box was installed after the spare carrier was. The clearance was tight but I did not have to remove the carrier to install the box. 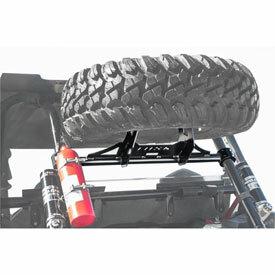 here is a link to a video that has the ryfab box in the bed of a rzr with the tusk UTV spare tire carrier. it doesn't allow it to open quite all the way but its pretty close. you can see it in the video. thanks for your question. You may need to copy the link and then paste it on a new window. Im not sure what kind of box that is but there is plenty of room below tire carrier to have s tool box or cooler or gas can. I really like it. I don't know. It works with the cargo box that I have on my razor. Would you still be able to mount an S&B Particle separator such that the separator is located so that the air intake is above the roof line? 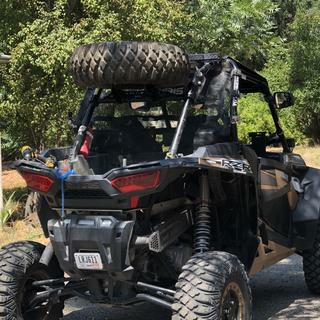 BEST ANSWER: I bought both the Tusk Spare Tire Carrier you see here, and also have a S&B particle separator installed on my 2018 RZR. The S&B mounted nicely just below the tire carrier. It gets plenty of air, and I am happy with the final installation of all components. I still have full access to my Polaris cooler mounted in the back, and full use of the back seats. You can always modify the particle separator using black pipe from home depot if needed. It all depends on what else you have on your cage.I had to flip my tire upside down to make it fit i am also running 32 '' tires, my spare is about half way past the roof line. I had an aluminum roof, so there was more clearance. My fellow riders that had Particle Separators used a spare tire mount that fit between the auxiliary bars over the cargo area. Their spare tire mounts would flip open to get to cargo. I think it will be possible if you have the spare wheel mount lower down than the roof itself. But I’m not 100% sure. But you can bring the mount down fairly low if your not carrying a lot of luggage. It would depend on how far back the roof extends from the horizontal top cage bar. 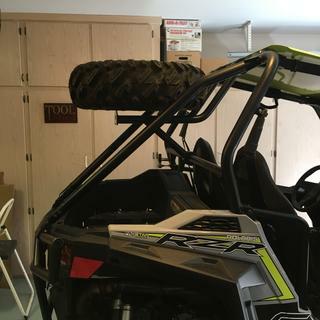 If the back of the roof is even with the bar, I think you would be OK but I'm not near my RZR so I can measure. Thanks, the roof I have is the Polaris plastic roof. In order to get the separator above the roof, the mounting brackets need to point upward from the cage bar. At the very least, you'd need to notch the roof to allow the brackets through it. Has anybody used this carrier with a 32" tire? I mounted a 32” tire on it for a friend of mine to make sure it fit I believe it was a maxis carnivore, it’s close but it fits I have pictures. I’m using it with the standard tyre, but I’m sure it would have space for the bigger tyre. I use it with a 32x10x14 tire. Works great. Yes, if you have it up higher. I have heard different opinions. Will this carrier hold a 32 inch pro armor crawler on a Polaris XP Turbo? The description says up to a 30 inch tire, but some others has said a 32 will work. Can anyone confirm or deny this? BEST ANSWER: Jason it should work I have a 30" tire on mine and there is at least 2" between the tire and the back window. 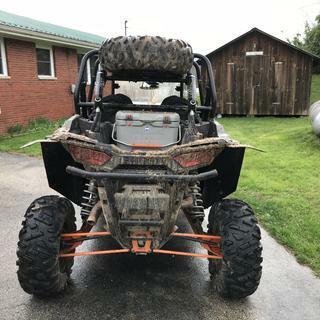 If it is too close on yours all you will need to do is move the mount a little lower as the rear cage is sloped and moving it down will give you more clearance. There is plenty of clearance on the sides. 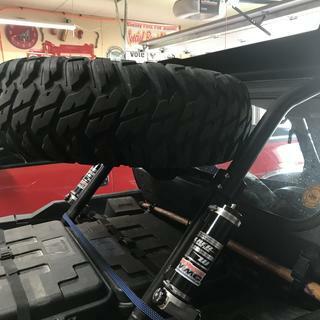 I am unable to confirm a 32 inch would fit as I do not run 32 inch tires and looking at the 30 inch I have mounted i'm not sure there would be enough room for a 32 inch. not saying you couldn't make it work but looks like it would be a tight fit unless you mount it as high as possible. I was able to get a big horn 9x29 inch front on, but it was tight. The back 11x29 had to be flipped up side down and strapped on. I can't see a 32 inch fitting. The lower curved bar on the carrier is the main limiting factor. I have a stock 29-9-14 new front tire and wheel and only have one inch clearance to rollbar on each side.So if you measure a stock new front and your 32 you will have your answer.My guess is no ,but tire sizes do vary. It will hold a 32 just fine. will a 31" tire fit I have a 2018 rzr4 turbo? BEST ANSWER: Depends on what roof you have. I have an aftermarket roof that bends down with roll cage and 30” is max, unless you install tire carrier at highest point and flip the spare tire over so the outside of the wheel is touching the carrier plate. It will stick above roof line but I’ve never had any issues. I have 32” tires. 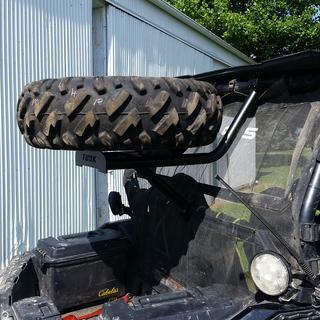 A 31” tire may fit if you have a Polaris roof that flips up in the back and you install carrier lower. Hope this helps. No. I had to buy a 2 inch spacer to fit a stock 29" back tire on my 2017 turbo 4. I happen to have a spare rim from a buddy. 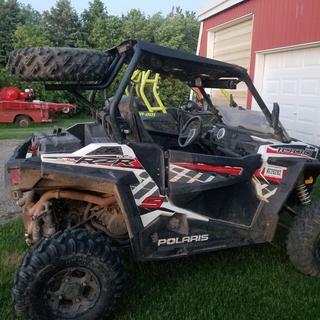 I have a rzr4 1000 with 29. My roof keeps me from putting anything bigger on. It should, I mounted 30 " on it and there seems to be enough room for a 31"
Will this fit with the Can Am cooler attached to the back? BEST ANSWER: Yes it should, just test fit with cooler in back when mounting. I ride with a full size yeti under it. Mine works good with my tool box and cooler. Good tire holder, adjustable up & down is nice. Can you give me the height from the base of the bed to the base of the tire rack? Will this fit a high lifter? BEST ANSWER: I am very pleased with the spare tire mount. I like the fact that i can see behind me on trails with my rear-view mirror. It should, I think the cage is the same, a high lifter just has a different suspension. Wasn't sure with the snorkels in the back. It should, unless the cage has been altered. Yes, I have mine on a 2016 high lifter . 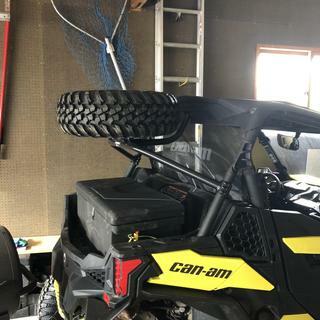 Will this mount interfere with the trunk cover for the Can Am Maverick Sport 1000R DPS trunk - Part #1845900001 - or are they compatible? BEST ANSWER: I have a 2019 Maverick Trail 1000 with cargo cover . This tire carrier does limit the cover lid opening to full height. I added 1/2" plastic spacer between spare tire and carrier to increase lid opening gap. I can easily remove 20L cooler from cargo space. Hi Bob - thanks for the reply! I just had the carrier installed and actually flipped the spare tire over on the mount. I added a protective pad between the painted finish of the rim and the mount to eliminate the possibility of paint scratching. That gave me some extra room and, while still not able to open the cover the entire way, I am able to get more than enough access to the trunk box for a cooler an additional cargo. Just wish I they made a mount for the TUSK scissor jack for our 1000's like they make for the Polaris. Thanks again for reaching out!! Great machine!! Safe riding! I didn't consider turning the spare tire, I'll try that. I just ordered a jack as follows, Can't miss on a Good Deal !! I sold may 2016 Maverick Sport 1000R XC 60"W for a Trail Legal 50". These Items Have Shipped from our PAYSON, UT warehouse. 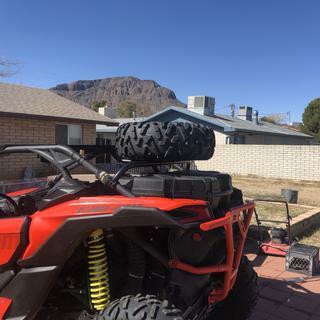 I had the tusk spare mount on my RZR it did interfere with my trunk space but the space I lost was worth the peace of mind to have a spare tire. It interfered a little on my rzr 900, but I can still open far enough to use it. I have a 2017 Maverick X3 DS. Will this work with the LinQ 12 gallon cargo box? Is there enough room for the box to open sufficiently? 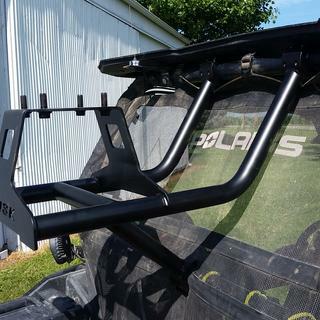 BEST ANSWER: I have the Tusk Spare Tire Carrier on my 2016 Polaris 1000 4 seater. I have a 12" high 16" wide 24" length box. I have the rack so top of the tire is same as roof. The box lid opens about 90% up, which is all I need. I asked RM a similar question, they told me the space under the carrier is13.5". 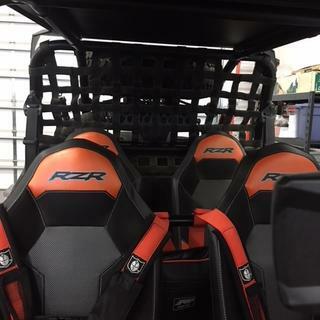 What is the distance center to center on the two mounting arms that go to the roll bar under the roof on the model that fits a 2015 RZR 900 EPS trail? No clue. I had the ends chopped and reangled to fit a pro armor cage. This tire care is meant to fit stock cages so if you have a stock cage it will fit. 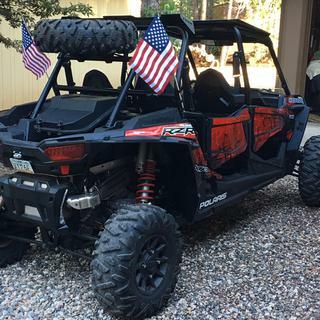 Mine is 2014 1000 it fits great and looks great the distance is 28 inches I think the 900 has the same roll bar. I have the 900 trail model. 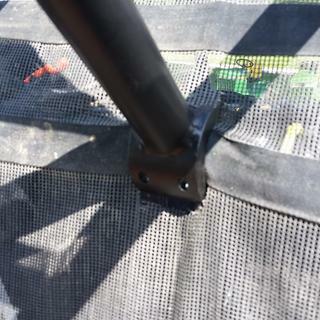 It clamps to the upper arm of the std cage and to the lower arm behind the seats. 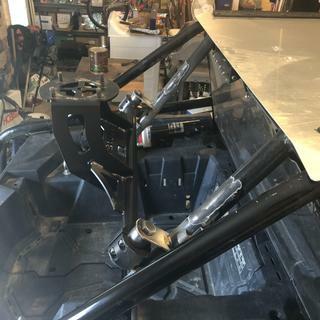 I have an aftermarket roll cage and need to know the distance between the mounting holes? 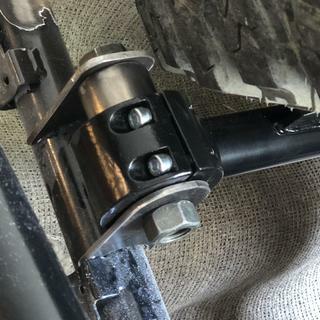 There are no mounting holes.There are two large couplings which slips over the two bars which come down from the roll cage to the back of the unit.If you have an aftermarket roll cage you need to make sure the distance between the two bars is the same as the orginal roll cage. The fit is right on so I would tell it needs to be exact. My unit isn't close to me at present so you will need to go by a dealer to get the measurement. The carrier clamps around the cage. You do drill holes to mount it. 28 and 1/8 inch center to center of bars on stock cage. Is there anyway to get more pictures of this on a Maverick trail? BEST ANSWER: I don’t have any I would suggest YouTube. I have found many helpful videos on repairs and accessories the Rocky Mt website is very helpful as well. 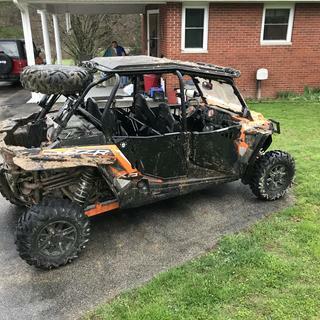 I don't have a Maverick, but I can send you some pictures on a Rzr xp. Does anyone that has one use it with 32" spare tire? BEST ANSWER: Sorry, I don't have that answer. But, I feel it would fit. It just might not fit under the roll bar at the back of the unit, unless it can be mounted lower on the side down roll bar tubes. Hope this helps.